So what else did my mom and I do on our apartment hunting trip to Dallas? We ate! And some other stuff. Wednesday after looking at all the apartments we grabbed lunch at Cafe Express. 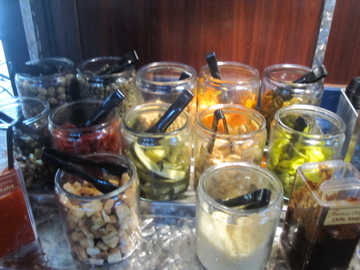 We wander in not knowing what it was, but there were TONS of different salads, sandwiches, and pastas to choose from. 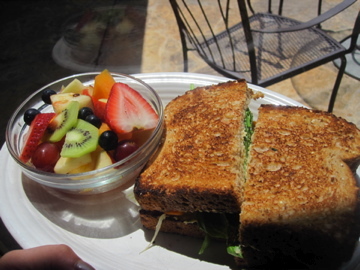 I ended up with a great veggie and hummus sandwich and a side of fruit. Just what I was craving. After I chose my apartment, we drove all around Dallas to see what my commutes would be like. We stopped by both the store I will manage and the store I’ll train at, as well as spent a good hour finding the two Bikram studios in Dallas. Totally necessary. 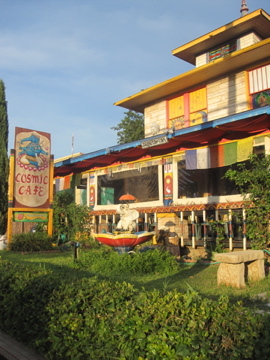 For dinner we tried a place that had been consistently recommended to us, Cosmic Cafe. Supposedly the best vegetarian restaurant in Dallas, I couldn’t come down without eating there! 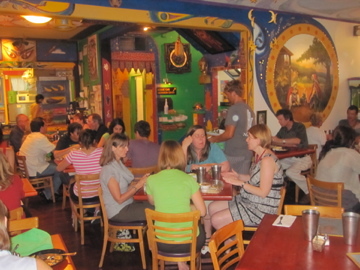 This hybrid Indian/Mexican restaurant had a totally funky vibe inside that I dug. It even had meditation rooms upstairs:) My mom and I both had Kirin beers while looking over the menu. 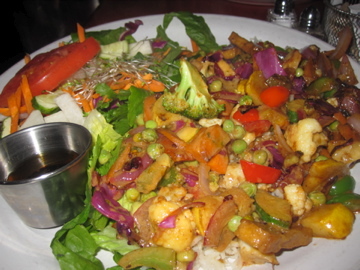 We wanted to try a variety of things, so we ended up splitting two main dishes – Buddhas Delight and Cosmic Stir. 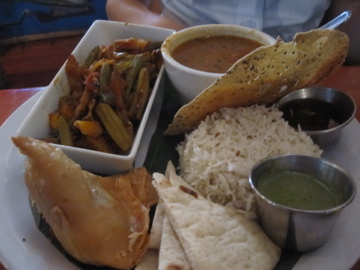 We meandered our way through each and every aspect of these dishes until the plates were clear. 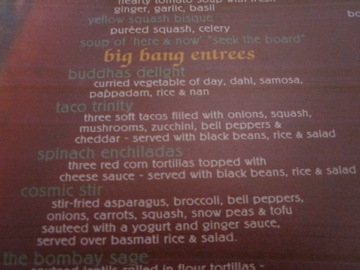 I will be going back for their Dahl during chilly winters and the Cosmic Stir is going to become a regular meal for me. It was INCREDIBLE! I wish I could describe the yogurt-based, slightly sweet Asian dressing on it in some way other that “MMMM”, but I can’t. It was just delicious! The only disappointing part was the Samosa. It was just too greasy and tasted like a weird savory funnel cake. Post dinner we walked around West Village, a fancy schmancy shopping district and just so happened to come upon a Pinkberry (totally planned). I got a mix of tart and salted caramel topped with dark chocolate crispies and chocolate candies. Perfect ending to the day. No wait. I forgot about the condom stores we passed on the way home. For real Dallas? There are no zoning laws so there are “Condoms To Go” and “Condom Sense” stores on the side of the street. Soooo strange…. Now the night is complete. from → Dallas, Dessert, Dinner, Lunch, Mom, Random, Restaurants, Travel, Trips/Vacations! Dallas seems like such an awesome town! And condom stores? I’m sold! But just wondering, how much hotter is it in Dallas compared to STL? Haha the condom stores are too funny! I remember there used to be one called “Condom Revolution” on the way to Newport Beach. How could you possibly fill a whole store with condoms?! Omg that is awesome…condom stores? Hahahaha. So happy you found a place that you like! Cosmic Cafe looks amazing!! Are the Bikram studios within a good driving distance? Looks like you’ve found some good places in Dallas! 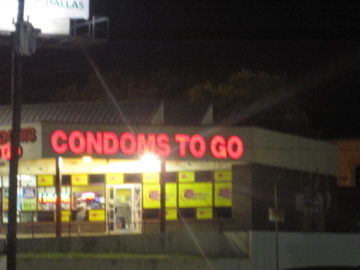 Condoms to go? Really? I didn’t know people put that much thought into which condoms they purchased. That sounds like you and your mom had such a fun trip! Hahaha I never knew there was even such a thing as a condom store that is too funny! That sounds like a great first day in your new home! How fun that your mom and you could explore together! That vegetarian restaurant looks great! I might have to go there next week! And I hate it when samosas are like that! Sometimes they can be so yummy but other times they are like fried rocks- yuck, no thank you! And omg salted caramel pinkberry? That sounds like a fabulous new flavor that I need to try! Hahah.. those condom stores are too funny! I love that you scoped out the Bikram Studios!! 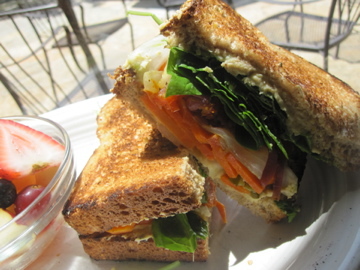 And the sandwich from the first place looks awesome! I am definitely headed to Cosmic tomorrow for my birthday. I have lived in Dallas all my life and have never been there. Ridiculous I know, but I am super excited! Wow! Those are some awesome restaurant choices! 🙂 that sandwich looks so good! HAHA! I remember Condom Sense from when I was a kid in Dallas. Every time we would drive to the orthodontist, I would see it and giggle.